The balconies of the rooms overlook the main pedestrian street full of shops, shops, bars, restaurants, pubs. On the back a romantic view of the rooftops. Walking along the central street in a few minutes you arrive in Piazza Vecchia and in the splendid monumental center. The apartment is very quiet and spacious, ideal for resting, reading, working. There are two bedrooms, one double and one twin. The sofa in the living room becomes a fifth comfortable bed on the occasion. A closet area, a veranda in the bathroom area with bathtub and shower. For guests courtesy set with bubble bath / shampoo, soap, bath cap and hairdryer. The cozy living area is organized to allow maximum comfort, a flat-screen TV with USB input, a desk so you can work and surf comfortably, a dining corner with fully equipped kitchen. The high speed fiber wi-fi connection is active in all rooms. For breakfast or a break available to guests there are a kettle, coffee machine, traditional moka, coffee pods, tea and infusions, jam, honey, biscuits, brioche. We take great care in the cleaning and hygiene of the house. 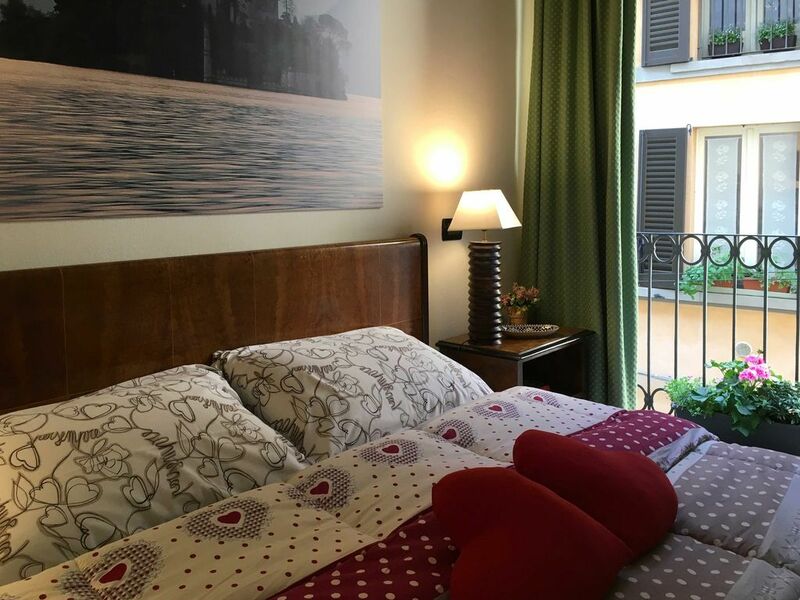 Whether you are in Bergamo for tourism, or work commitments that lead you to spend time in my beautiful city, you will find the ideal accommodation to feel at home. I'm designer. I live and I work in my house in Città alta. I love the art world. I did some exhibitions of my photography and assemblages works. In the apartments you will see some reproductions. In 2005 I pubblished a book of photographs, "PASSAGGIO A MONTISOLA". Montisola is a island in the Iseo lake, where a passed long time. There I started to create some assemblages of fantastic fish, made with the worn glasses of the lake and wood. I have traveled and known many countries. I love the sea and skiing. The apartment was my mom's, therefor I call it MammaMia. Life in città alta is a quiet, small neighborhood, where everyone knows each other. Mammamia is on the central street, Corsarola. The road is always lively in all seasons, but a quiet pedestrian zone. It's nice to walk and get lost in the alleys of the upper town and walk with the pace of an ancient dimension of time. The monumental area is five minutes from home. The flat is at the 2nd floor of a peaceful building. Its balconies face the charming “Corsarola”, in the core of the old town, full of restaurants, bars and shops. It is five minutes on foot from Piazza Vecchia, the main square with its beautiful architectural ensemble. It is two minutes on foot from the Orio al Serio airport bus stop. Staying in the heart of the old town it is a unique and pleasant experience in every season. The flat location allows you to enjoy the old town life at its best. Visit the city’s beauties and relax in one of the many bars and restaurants the neighbourhood offers. If you like shopping, you will be pleased to discover the many different shops. We liked the apartment and the location in Bergamo Città Alta. The apartment in Città Alta is very central with all of the shops, bars and attractions close by. The bus stop is very near also, along with the Funicolare to the lower city and the Funicolare to San Vigilio. The walk around the city wall is very nice and scenic. The location of the apartment is really ideal for spending a holiday in the old town. Gorgeous apartment in a perfect location. This apartment is the perfect place to enjoy time in the lovely Citta Alta of Bergamo. It is spacious, clean and well provisioned. Renata met us at the bus stop and walked with us to the apartment to show us around. We all wished we could stay much longer and will definitely try to return on our next visit. We love visiting Bergamo -it was our second visit - and would highly recommend both the city and this apartment. Thank you Renata, we hope to be back for the next school trip in two years. Grazie mille! It's important for me that my guests have a nice stay in my apartment. Waiting for you next time. My daughter and I had an absolutely marvellous time in Bergamo. Thanks must go to Renata for her kindness. She text me with instructions with the bus details from the airport and waited at the bus stop at the Cite Alta. She took us to her lovely apartment in the heart of the old town. How we loved it . Old charm with Renata s art work on the walls. Two bedrooms and a nice kitchen/ living area all with Juliet balconies. So close to all the amenities. If you go..take the fenicular up to the old castle where the Vista is breath taking. Renata and I met for coffee...she felt like a friend. If We go back we will go to the same place. THANKS to Renata it felt like home. My Italian must improve!! Thank you Christine, Our coffee was really friendly. I hope see you soon and have time to have another longer one! Renata is a very special wonderful hostess. The apartment was perfect for us. Clean and full of Renata’s artwork. She was always there to answer questions and make sure we were parked in an appropriate spot. Would visit again any time. Citta Alta is full of people on weekends so be prepared for crowds and some noise, but the location is excellent. It was a pleasure to know you. Clean, neat, well appointed and fantastic position. Great host. Highly recommend this property. The property has 2 bedrooms; one queen and the other has 2 singles. It has one bathroom and toilet and a well appointed kitchen area. Renata provided 2 fans immediately on request during warm weather and she could not have made us more welcome or been more helpful. She was an excellent host. The position is perfect with great access to the main attractions in the old town. It is also a very short distance to buses to the airport and train station. There is no lift so need to carry bags up 2 flights of stairs. We would highly recommend staying at this property. Thank you Tom, you are lovely guests! Mama Mia is a great place to stay in Bergamo. It is centrally located on a beautiful lively street. We had a lovely stay at Mama Mia. We had plenty of space, a kitchen in which we coul keep a few groceries and we’re just steps from charming shops and restaurants. Renata was a great hostess! Grazie Ann, it was a pleasure have you in my house! The city's attraction is the historic village of the upper town, surrounded and protected by its splendid Venetian walls, overlooking the city. From the walls of the walls, a classic destination for city walks, you can admire the whole plain. On the clearest days, the Milan skyline and the Apennines stand out on the horizon. The village retains its ancient charm, between streets and lanes that always lead to discover enchanting corners. The central street, called Corsarola, winds through shops, bars, shops, always alive and attractive at any time of the year. The heart of the village is Piazza Vecchia, of which Le Corbusier said "you can not touch a stone anymore, it would be a crime". The Piazza della Ragione, the civic tower called Il Campanone, the Angelo Mai Library, is fascinating this square. In the center of the square the beautiful Contarini fountain. On the back of the square there is a view of the Basilica of Santa Maria Maggiore, the Cathedral, the Colleoni Chapel and the beautiful Baptistery. From MammaMia reach the square in two minutes on foot.